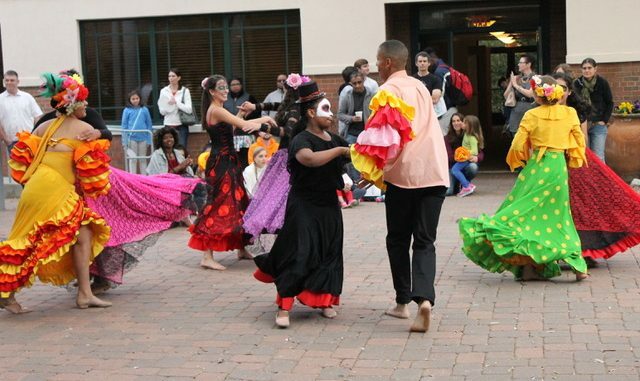 As one of many U.S. cities with a prominent Latin American community, Richmond’s Día de los Muertos festivities included a cultural celebration put on by the Latin Ballet of Virginia (LBV), complete with traditional altars and Aztec costumes. Día de los Muertos — or Day of the Dead — is a Mexican tradition dating back to pre-Columbian civilizations that honors and celebrates the lives of deceased relatives. The celebration of life has spread to countries in Central and South America, in addition to the U.S. 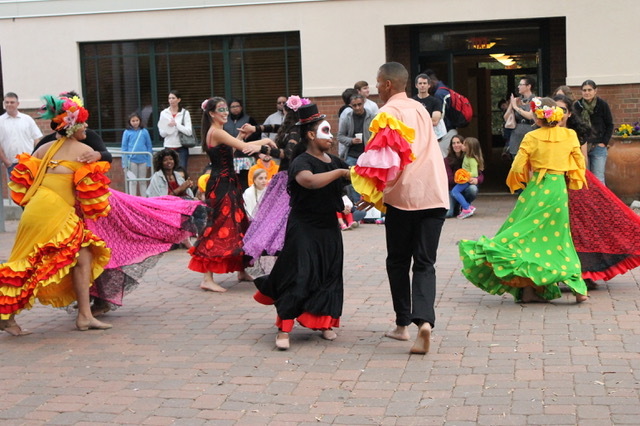 The annual LBV Día de los Muertos celebration took place at The Cultural Arts Center at Glen Allen, featuring food, arts and crafts, dancing and vendors. K Alferio, president of The Cultural Arts Center, has been part of the festival since she started her role at the center almost 10 years ago. The festival’s goal is to keep the traditions of the holiday as culturally accurate as possible. The event featured an Aztec ceremony with a native dance and incense burning to honor the dead. Alters were set up and decorated throughout the building, complete with photos of the dancer’s relatives. Attendees were also encouraged to bring photos of anyone they want to be remembered. The dancers dressed in traditional Aztec costumes chosen to resemble original rituals. The activities set up for kids and their parents during the festival included coloring masks, a piñata, face painting and making maracas. Attendees were also encouraged to wear their own costumes. “It’s a different way to look at what we call Halloween,” Alferio said. Ana Ines King is the founder and artistic director of LBV and was also a faculty member in the department of dance and choreography at VCU for several years. Her passion has driven her to formulate events such as the Día de los Muertos festival to help familiarize Virginians with Latin culture. King said celebrating death as it is portrayed in Día de los Muertos is seen as taboo in some Latin American nations, including her native country of Colombia. Since Catholicism is the predominant religion in these areas, celebrating death can be seen as sacrilegious. In many cultures, including in the U.S., discussing death is taboo. “It has been difficult to convince people to accept and welcome death rather than to fear it,” King said. With celebrations like Día de los Muertos, King hopes to get people to open up about the subject and celebrate the lives of the dead. King recently lost two people close to her — a dance teacher and a dancer. King remembers them by doing what they loved to do the most: dancing. She dedicated the performances to them. Dance classes are held at the Cultural Arts Center. For more information visit artsglenallen.com. For more information on the Latin Ballet of Virginia visit latinballet.com.